My oldest just graduated....so I made this 2008 book. This book would be great for your New Years celebrations or just recapping what has happened during this year. I used Glitz Frosting, Thickers Alphas and Sticklers. Maya Roads- ribbons, sheer paisleys, sheer journaling spots and chipboard. I did a little experimenting with this. I stamped the Maya Roads Sheers and then used perfect medium and UTEE on them. You can see the effect on the paisley. I then used a little frosting to add some dimension. A friend at the Scrap Shanty made an album "I Have Always." She had things that she loved and hated. I decided that I wanted to do an album about the things that I have always loved. I have always loved looking at my Granny's old photos. I love looking at them to this day and can just look at them for hours. I always wanted to see what it was like when my mom and granny were little. Reading has always been a passion. Like Abraham Lincoln, "The things I want to know are in books." When I was in Jr. High, I asked my mom what her favorite book was. She told me "Jane Eyre." It instantly became my favorite. I have read it innumerable times. I have seen every movie ever made of it. I believe I have been a constant source of entertainment to someone in my family all my life. I love singing and musical theatre. I can't say enough about paislies. This is one of my favorite dresses. When I see paislies...I think it reminds me of what an awesome childhood I had. I am most passionate about my family. My Granny is a special favorite of mine. This is a Creative Imaginations BE cake mini album I did to showcase a few pictures from Porter's birthday party. The paper was perfect with the bright color of her suit and the water slide was bright orange as well. All the paper was Creative Imaginations and K&Co embelies. Plus my new LOVE Tim Holtz Grungeboard with his crackle paint and distress inks. This stuff RAWKS! Hope you enjoy! As Denton and I were working in the yard today, I found these firecrackers I made a couple of years ago. 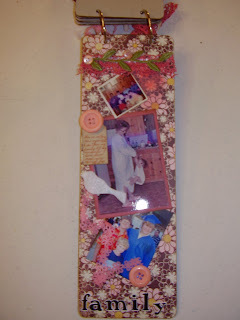 Have your hubby cut you some 1x6's, and 1x4's, dust off those making memories paint and foam stamps and get creative. When finished nail to a longer wood stake so it can fit down in a planter or your flower beds. Don't forget to add a little raffia and you are ready for that 4th of July party. Denton thinks this is his flower bed, of course I am the one doing all the work. When we bought this house I put this flower bed in and filled it with all my mothers favorite perennials, she is the one who taught me all about plants and gardening. Today I added some new gray lavender and tucked some yarrow around the rocks....Nolan would kill me if he knew what I spent at the nursery today, thank heavens he doesn't know plants nor read my blog! My favorite plants are Hosta's, I cannot believe how big they have gotten this year! Next year I will have to split them, so anybody interested in some let me know. I have been eye balling this white Hosta online, but its $50 and Nolan would freak out over a plant costing $50. I shocked him with my $75 rock I bought a couple of years....he is still not over that one! I can't get enough of thes jotters. What a way to have a great time. The jotters are all different sizes and patters so it is a great way to add some interest and depth on a LO when paired with glue dots and pop dots. I gathered several of these and just wrote down the things that Sam was thing one day. It doesn't take long to gather the thoughts. I just called Sam on the phone and asked him what he was thinking about today and all these ideas spewed forth. Some are very insightful. I paired these with some Jenni Bowlin and some more Luxe paper, stickers and letters plus Maya Road chipboard letters. I think this will be a wonderful memory to keep of Sam's active mind. This layout was made using Luxe and Maya Roads. To find my guy...you can look at the great Luxe arrows that I stamped. If you haven't used the Luxe stamps...you must! The ink lays down on the paper like butter. I am so not a stamper...but these stamps are just the bomb! The Jotters made it easy for me to document what we did on the trip! My favorite part of the LO besides all the picts of my cutie...are the chipboard letters. They are painted with Ranger's Crackle Paint. If you were to see it in real life, it does look like asphalt. I think used the most wonderful opaque marker around from Ranger and made the dotted lines. Luke loved the way that it turned out. This week Denton had soccer camp in the morning and 3 t-ball games at night. I loved watching them warm up in the morning with exercises and when Drew and him ran around the whole track I thought "how he has grown so much". Tonight they had their 3rd game this week and I have been very proud of him, but tonight when he was playing pitcher and the batter hit a high ball, Denton caught it in mid air. I had such a proud moment, or some would say a ah ha moment! And of course I didn't get it on film. Megan if you are reading this....that's "Tall Man"! What can you embellish in your make-up drawer? I have been so tired and busy, the last thing I thought I would have is a creative moment. But check this out, its pretty cool and can be used in so many things. I opened my make-up drawer this morning, and one of the mirrors had fallen out of the compact. I thought how cool would that be with a rubon, stamp or opaque writer. Now I am the worlds worse at cleaning my make-up drawer out, which this time is a good thing because I have lots of mirrors to play with. Can you believe I couldn't find ONE family rubon in my store, that's sad! So I stamped it and used my opaque writer, and this little embellishment cost me hardly anything! I dare you to experiment with your make-up mirrors! Email me what you come up with and I will post on her next week, plus send one of you lucky ladies, or guys a RAK! Two of the other word books that were extremely popular at the convention were these. First is a picture of the CRUISE book. It has been a big hit at the store for a month or so, but the convention goers were seeing it for the first time. I heard many wonderful comments on this and many, many people buying the papers to make their own. This second book is the Fourth of July Book. The letters say JULY4 and then if you look on the '4' you will see the "th" completing the cover. Isla did this book as well for us. She scurried right up until 3 or 4 in the morning of the day of the convention working on projects for the store. On this book, she used the Rusty Pickle Papers, which have nearly all escaped the store. We took them for mini store in the crop room and not many were even left after that. Since Rusty Pickle was at the convention, we kept what was left for the store. I have said to Isla that I think she sold more Rusty Pickle paper than they did with this book. I hope these give you some ideas on what to do with some of your photos. Even though I couldn't get the full project in here, you can see that the books will hold quite a few photos AND can be expanded with extra pages. Need help doing your first one of these? Come on by the store. We'll be glad to talk you through it! I have this passion for patterned paper. I love mixing and matching them. I have matted with card stock....but I like using patterned paper too! I made this LO of my little cousin Maisy. I know that the bolder paper in the background is Luxe Every Day. The other is Pink Paislee. The solid breaks can often be made with ribbon. I believe in this case it is Maya Road's Velvet Ribbon. 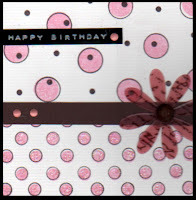 I added a Luxe rubbon on top of the patterned paper as well. Then I added lots of flowers and and some bling from Glitz. So...if you don't have any solid cardstock....don't panic. One of the big hits at the Great American Scrapbook Convention were the word books. Some are called Word Bloom books and some have different names. They are made by many places. Many booths had these books and they are pretty popular in general, but I felt like ours were extra special because of the examples made by the Design Team members. There were some other cute examples around the floors, but I didn't think any were any cuter than the ones made by our team. OK. I know I'm biased, but really, these were very very cute. First off is this COWGIRL book. 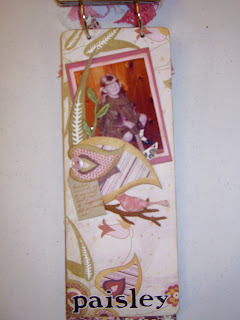 Coordinating both Carolee's Adorn It and Moxxie paper lines, Isla made this a beautiful book. She added just the right amount of great embellishments from the lines and made some of her own. The great star on the front of the book is from 10 second studio metal and molds. She outlined it with Glitz icing. Really grabs the eye, doesn't it? Stunning, sharp and stylish were words that were used to describe this book by attendees. The heart shape is a Heidi Swapp mirror with a rub-on. Isla always does a great job on any project. I'm sure it also helped to have so many adorable pictures of her granddaughter. The great flower of studs is from Prima Marketing. This is just one of the great books from the show--AND just some of the pages. I'll have to post the others in separate posts. I can't show you all of them on here--you may just have to head to the store to see them all. I have had several people point out that I have been a bad blogger lately. Well were have I been? Trying to recover from the convention, this picture of Sherri is exactly how we have all felt this week. I cannot believe how much it takes out of all us, and every year I say never again! But we must love it because we end up doing it the next year. Today Cheryl and her husband, from Ten Seconds Studio, came to the store to get a bunch of Maya Road product for her upcoming classes. We just love Cheryl and her family, sometimes I think we are part of their family! They were getting ready to go back and since it was dinner time I suggested us all grab a bite to eat. 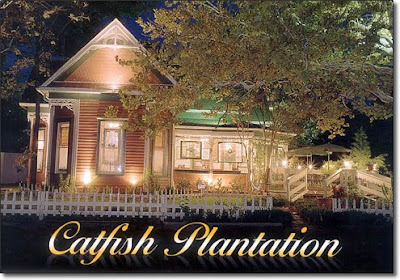 If you ever come to Waxahachie you need to experience The Catfish Plantation, its in a 100 year old home, beautifully decorated and did I mention haunted? They loved it, great food and great company. Cheryl loved how pretty her food looked, we found out at dinner that we both love Hell's Kitchen and Chef Ramsey. I think this is the first time I have laughed all week and of course ordered way too much food........can you believe the size of that Chicken Fried Steak? I have been in the mood to stamp and create lately. And that works out well because so far this week, I've needed five cards. Here are two that I did tonight and will be off in the mail tomorrow morning. 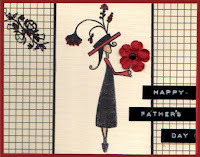 You know I am a card maker who loves to use scraps and left over do-dads. Both cards fit this description. I do need to add some red Stickles on my father's day card...but then I'll call it a night. I have to say that I had a blast working the convention. I had the most hectic and fun filled time meeting new people telling them about product and sharing my love for scrapping. I didn't get there until day two. Here we can see Carolyn still looking quite chipper. Here are some pictures of the booth. It was gorgeous, filled with eye candy and product. Sherri and Carolyn really out-did themselves on the design. Here is the bain of our existance. There was a power surge and it took our cash register out. So for two hours while Nolan was out getting a new cash register, we had two calculators. We were counting out change old school. My brain has never worked so hard! Oh and did I mention even with a calculator, the line was wrapped around our booth? Thank goodness for Ruthe. She stepped right in and helped us. She has a way with a crowd. She was calm cool and collected. Ruthe is my hero! Nolan was a hoot! He was hawking for us. 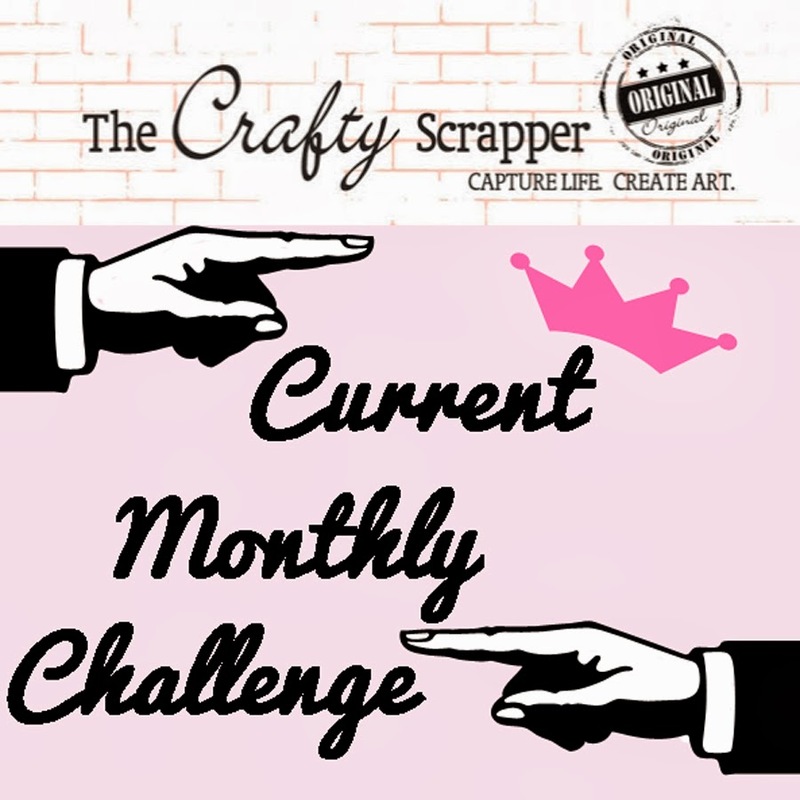 "Let's hear it for the Crafty Scrapper!" "Come on in to The Crafty Scrapper!" Plus he was putting in big plugs for the Waxahachie Chamber of commerce and tourism there on the square, so I think the whole town of Waxahachie owes him a debt of gratitude. Once Nolan got back with a new register, he was able to get the old register working as well so we had two registers going! Here we are at the end of day 2. Still smilin'. Carolyn decided to work the crop that night....so we did that. Here we are after the crop. Heidi is looking peppy still. Joanna helped with tear down and the crop. Here she is helping Nolan load the truck. Carolyn is all business here with Nolan's handy dandy all purpose knife. By the time I was finished with only two days of convention....I was toast. It has taken me a day and half just to gather the energy to post about it. I'm tired, but still filled with my scrappy high! I hope that all the new friends that we made will join us in Waxahachie soon! It was really awesome to be part of the most popular booth at the convention!